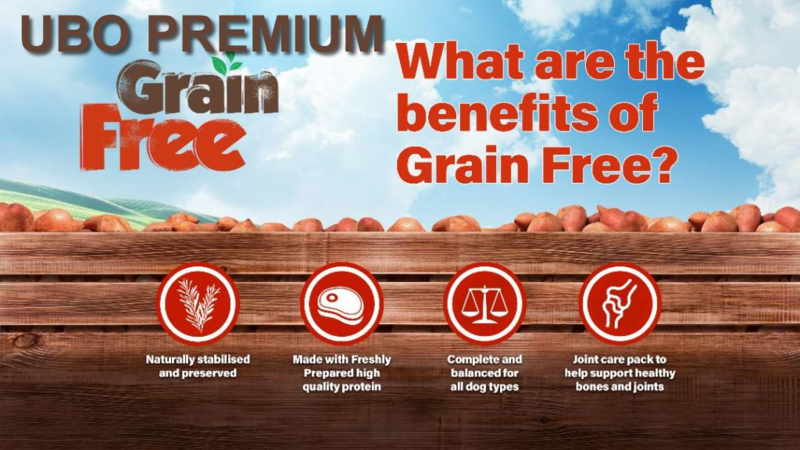 Freshly Prepared is a term used to describe the human grade quality raw and fresh meats used in your Grain Free recipes. A unique cooking technology trademarked as “Freshtrusion” is used to cook the meats at a low temperature and low pressure. This unique cooking process means that there is a higher nutrient bio-availability when fed to pes, with a more natural aroma and taste for an enjoyable, healthy and nutritious mealtime. The Freshly Prepared ingredients have other fantastic advantages including digestibility levels above 90% which is a better experience for both you and your pet. To see how much freshly prepared is in your recipes, simply look on the reverse of any of our Grain Free bags. Puppies require an appropriate high level of protein to support growth and development through this crucial phase in life. This is usually higher than an adult’s requirement as this is the fastest development phase within a dog’s lifetime. During this phase they also require an appropiate and controlled Calcium and Phosphorus level to ensure correct bone development, which is especially important for large breed puppies. The Puppy feeding guide follows the growth curve. As puppies grow, they require more foood. This requirement reduces when they reach their adult life stage and are therefore fed less. If they continued to eat the same amount of food required for puppy growth in their adult stage, they would be over fed and potentially put on weight. Puppy feeing guides are based on the expected adult weight of a puppy in order to provide a more accurage feeding recommendation. If the feeding recommendation was based purely on the current puppy weight – the breed size, age and growth phase would be unknown, making estimations of the feeding requirement unreliable. The feeding level is enough to provide otimal nutrition for a young dog, without supplying excess nutrition to cause weight gain or cause young dogs to be hyperactive. Natural, complete & balanced for Adult Dogs. This extensive range includes a wide range of delicious recipes. Come and have a look in-store to see what we have to offer. Why do Seniors need a special recipe? Senior & Light recipes are designed to be suitable for those dogs over 7 years old and those who have excess weight. A senior diet is designed to help support the joints, have higher fibre content in order to help “keep things moving” and have reduced energy content in order to help prevent weight gain in those golden years. A careful blend of Glucosamine, Chondroitin and MSM helps support joints and helps to sustain joint repair and mobility. This recipe includes L-Carnitine, an essential amino acid which can help maintain a healthy weight and contribute to lean muscle development. How do light recipes reduce weight? Our light recipes have added L-Carnitine, an amino acid which promotes lean muscle development. L-Carnitine promotes the conversion of fat to muscle for lean muscle development. This works by transporting fatty acids into the mitochondria within cells where they can be “burned up” and used as fuel. L-Carnitine has other added benefits which include helping to enhance brain function, reducing muscle damage and regulating blood sugar levels. “Light” products have been specifically formulated with added ingredients to help with managing a pet’s weight. Your light recipes are 15% lower in fat compared to standard adult products in order to aid weight reduction. As it is the calories which are reduced, this does not mean that a pet has to eat less, they can still consume a normal amount of their food. All of our Grain Free recipes are made from a wide variety of human-grade-quality food, sourced from the finest farms and fisheries. We know that providing pets with highly nutritious, healthy and great tasting food will provide them with the best quality of life. We also know that sourcing our ingredients directly from our farms and trusted sources provides a guarantee of the highest quality products. Our UBO DOG food range is made in the UK, in Europe’s most advanced and environmentally sustainable pet food manufacturing facility, which produces some of the world’s finest pet foods. We feed and recommend Ubo Dog Food at our luxury Dog Hotel. Your dogs need a balanced diet containing a wide range of nutrients, made easily available in our balanced tasty pet food. Your pets’ health and happiness depend on you and the food you choose. Our super premium range is hypoallergenic (formulated without wheat and wheat gluten) and is therefore suitable for dogs with sensitivities to these ingredients. The range comprises of the very best nutrition for all sizes, life stages and lifestyles of your pet – however sensitive they may be. ‘Completely Fresh’ is more nutritious, as raw ingredients naturally contain higher levels of nutrients and antioxidants supporting the health and well-being of pets. Freshtrusion technology allows more fresh ingredients to be used in dry pet foods than any other extrusion system in the world, including fresh meat and now fresh vegetables, herbs and botanicals. This revolutionary process pushes the boundaries of super-premium dry pet foods far beyond that offered by any other manufacturer. Fresh ingredients are more palatable and have a higher digestibility, resulting in less waste which in turn is easier to pick-up and dispose of. The type of protein, its source and digestibility are very important for pet health. Meat is the best source of protein for dogs, combined with a balance of amino acids from animals and plants for ideal performance. Once a protein is ingested it is broken down into the individual amino acids that are used as building blocks for healthy growth and repair of tissues (muscle definition and coat condition). Carbohydrates are a good source of energy in pet food, consisting of easily digestible starches and more complex carbohydrates such as cellulose (fibre). Potato , rice and peas are good sources, encouraging lower feed requirements and smaller, firmer stools. These are essential for the long term health of your pet. Vitamins are necessary for many of the body’s processes and they can act as antioxidants which help prevent ageing. Minerals are required for healthy bones, skin and overall cell function.